So a few weeks ago I got a message on FB from Jen. Jen myself and our husbands were in the same Bradley Method Birthing class a little over 5 years ago. So fun were the weekly nights of learning how to focus, making low noises and watching live births on tape!! Mikko and I did not finish our class since our son decided to come a month early but what we learned in that class was great and we used the methods again when our daughter was born. Ok well let's come back to the present. I get a message from Jen saying she really likes the pictures of all the cookies and cakes I have posted on my Facebook page and asks me if I am interested in making her daughters birthday cake. I was a little surprised as cakes our not really a strong point for me but said I would give it a shot. 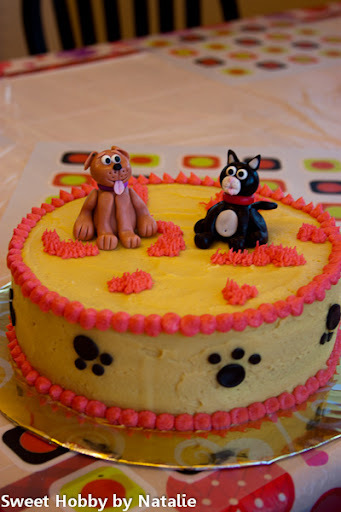 Her daughter, Paris wanted a dog and cat cake and after I realized she did not want a cut out cake but a cat and dog made of fondant, I told her I did not know how to do that. 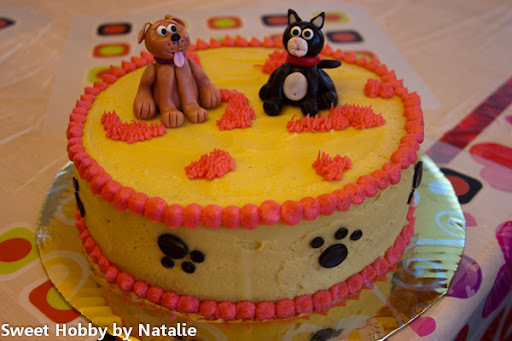 Well I Googled a dog fondant tutorial and found this. I watched a few times then did a practice run. I then just looked at a picture of a cat made from fondant and then made the cat. This picture is the original cat and dog that I did. I sent the pics to Jen and she liked it and so I was "hired" to make the cake. 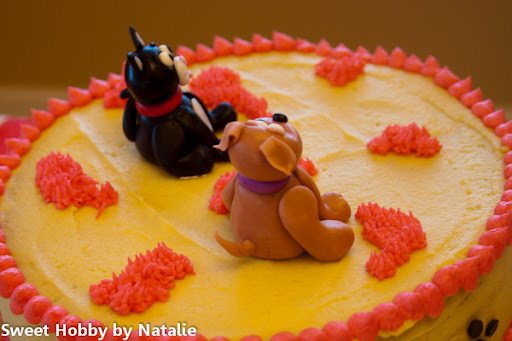 Paris picked all the colors for the cake including the dog and cat. She also wanted a Vanilla cake with lemon filling and lemon frosting. I think it turned out pretty good. What do you think! I love the little tails, so I had to take this shot. I hope that they enjoyed the cake. Happy Birthday to Paris.